For other people named Kyle Larson, see Kyle Larson (disambiguation). Kyle Miyata Larson (born July 31, 1992) is an American professional stock car racing driver and World of Outlaws Sprint car team owner. He currently competes full-time in the Monster Energy NASCAR Cup Series, driving the No. 42 Chevrolet Camaro ZL1 for Chip Ganassi Racing. He is the 2012 NASCAR K&N Pro Series East champion and a rookie of the year. He is the 2013 NASCAR Nationwide Series rookie of the year as well as the 2014 NASCAR Sprint Cup Series rookie of the year and a overall winner of the 2015 24 Hours of Daytona. A resident of Elk Grove, California, Larson attended his first race with his parents a week after his birth; he began racing at the age of seven in outlaw karts in Northern California. As a teenager, he raced open-wheel cars, including United States Auto Club (USAC) midget, Silver Crown and sprint cars, competing for Keith Kunz Motorsports and Hoffman Racing with Toyota backing; he also raced in World of Outlaws sprint cars. His first sprint car race win came at Placerville Speedway, where he was one of the youngest drivers to ever compete. He won the 2011 4-Crown Nationals at Eldora Speedway, winning in all three types of USAC cars in a single night, only the second driver in history to accomplish the feat. He holds the sprint car track record at Ocean Speedway in Watsonville, California, set in 2010. In 2012, he won six USAC National Midget races including the Turkey Night Grand Prix. While there was some interest in IndyCar racing, Larson was signed for the 2012 racing season by Earnhardt Ganassi Racing (EGR) as part of the team's driver development program. In February of 2012, at the Pete Orr Memorial Orange Blossom 100 at New Smyrna Speedway, Larson made his first start in a full-bodied stock car, and won the event, leading only the final lap of the race. He won again at the speedway a week later during the World Series of Asphalt. Larson ran full time in the NASCAR K&N Pro Series East, driving for Rev Racing. In the first race of the season at Bristol Motor Speedway, Larson finished 9th. He got his first career pole at the Bowman Gray Stadium and finished 5th. He won his first K&N Pro Series East career win at Gresham Motorsports Park in Jefferson, Georgia. Larson earned his 2nd career win at New Hampshire. He made his ARCA Racing Series debut at Michigan International Speedway, driving for Eddie Sharp Racing; he finished 13th in the event. Larson returned to ARCA in 2013 where he finished 2nd to John Wes Townley at Daytona. In 2014, Larson earned his first ARCA Series win at Pocono Raceway from the pole. On November 3rd, 2012, Larson won the NASCAR K&N Pro Series East championship, with two wins and twelve top tens in 14 races, overcoming the five wins of Corey LaJoie (son of two-time Busch Series champion Randy). Larson also named the NASCAR K&N Pro Series East Rookie of the Year. In late June of 2012, Larson made his Camping World Truck Series debut at Kentucky Speedway, driving the No. 4 truck for Turner Motorsports. He finished 10th in his first truck start. In April of 2013, Larson won his first Truck Series win at Rockingham Speedway in a close finish with Joey Logano; During the celebration, Larson performed donuts without his steering wheel on, a practice he had acquired when racing go karts; the celebration prompted NASCAR to request him to keep it attached, regarding safety concerns, as Larson would not have much control of the car without the steering wheel. He later finished second in the inaugural Mudsummer Classic at Eldora Speedway. In 2014, at the Eldora Speedway, Larson's truck gave up after he got in the wall couple of times while trying to chase down the leader Darrell Wallace Jr and finished 26th. In late of 2015, at Chicagoland Speedway, Larson started on the pole after qualifying was rained out. Larson led 49 laps and ran out of fuel on lap 148 and finished 7th. In 2016, Larson drove the No. 24 truck on a part-time basis for GMS Racing. He finished 4th at Martinsville Speedway. Later in the year, he won at Eldora. Larson finished 4th at Homestead after leading 76 laps. In 2013, Larson moved full-time to the NASCAR Nationwide Series, driving the No. 32 for Turner Scott Motorsports. On the last lap of the DRIVE4COPD 300 at Daytona International Speedway, he was involved in a violent crash, in which his car went airborne and pierced the catchfence, completely ripping the front end of his car off. He was unharmed, but the debris hurt a number of spectators in the stands. In the inaugural Nationwide Children's Hospital 200 at the Mid-Ohio Sports Car Course, Larson was sent off the track and into the tire barriers on lap one. However, after falling three laps down due to repairs, Larson recovered to finish on the lead lap in 14th. Larson finished 2nd at Homestead and finished 8th in the standings. After going winless, Larson won the Nationwide Series Rookie of the Year, becoming the first Asian-American and first Drive for Diversity participant to win a Rookie of the Year Award in one of NASCAR's national touring series. In 2014, while Larson moved full-time to the Cup Series, he drove the No. 42 on a part-time basis. He captured his first career pole at Bristol. He finished 2nd to Kyle Busch. On March 22, Larson won his first Nationwide Series win at Auto Club Speedway, holding off Kyle Busch and Kevin Harvick. In victory lane, Larson stated, "Those last 11, 12 laps were the longest laps of my life. I've been so close to winning so many times, but the fashion we did it in was extra special." Larson once again celebrated by doing burnouts in the infield without a steering wheel. On May 24th, Larson earned his second career win at Charlotte Motor Speedway, edging Brad Keselowski. In 2015, in the PowerShares QQQ 300 at Daytona International Speedway, Larson finished 8th after being spun out on the last lap. Larson won the season-ending at Homestead-Miami Speedway, and the first win for HScott Motorsports. In 2016, Larson continued to drive the No. 42 part-time for CGR, sharing rides with Justin Marks. During the race at Charlotte Motor Speedway, Larson passed Joey Logano with 15 laps to go and almost won the race until a caution came out with 2 laps to go. Larson lost the race to Denny Hamlin and finished 6th. In a bit of redemption at Pocono Raceway, Larson won the rain-shortened Pocono Green 250. He would win again later in the season at Texas Motor Speedway. In 2017, Larson earned his 6th career win at Auto Club Speedway, holding off Joey Logano. He won at Richmond International Raceway. Larson also won at Dover International Speedway from the pole. In 2018, Larson won at Las Vegas, holding off Christopher Bell. At Daytona July race, after Justin Haley made an illegal pass below the double yellow line, Kyle Larson was declared the winner. Larson earned his 12th career win at Bristol Motor Speedway. On August 27, 2013, The Charlotte Observer reported that Larson will race full time in the No. 42 for Chip Ganassi Racing, starting in 2014, replacing Juan Pablo Montoya; and will compete for the rookie of the year honors. The deal was officially announced on August 30, 2013. On October 1, 2013, it was announced that Larson will make his Sprint Cup Series debut at Charlotte Motor Speedway, driving the No. 51 car for Phoenix Racing to prepare for his rookie season. At Charlotte, Larson qualified 21st and finished 37th after an engine failure on lap 247. Larson ran another Cup race at Martinsville, where he qualified 26th and finished 42nd after another engine failure. At Texas, Larson finished 23rd. He finished 15th at Homestead-Miami Speedway. In his Daytona 500 debut, Larson got into the wall twice, and despite fixing the damage, he spun out on lap 22. Larson finished 38th after being crashed out by Austin Dillon on lap 163. On March 23, at the Auto Club 400, Larson started 9th on the green-white-checker, gained five spots on the first lap of the GWC, and caught up to the leader Kyle Busch on the final lap, finishing second. At Richmond, Larson recorded a speed of 126.880 miles per hour (204.194 km/h), and after qualifying was rained out, Larson started first based on being the fastest in practice. During the race, Larson was spun out by Clint Bowyer on lap 1, but recovered later and finished 16th. Larson finished 9th at Talladega after starting 29th. Larson had a very impressive run at Pocono Raceway where he ran in the top ten the entire race and finished 5th. At Michigan, Larson spun out on lap 7. Despite that, he spent 33 laps recovering from 43rd to finish 8th. During the Michigan race, Larson blocked one of his strong supporters Tony Stewart trying to go for the lead, the block damaged Stewart's grille. In response, Stewart tried to retaliate under a yellow-flag period. When told that Stewart was mad at him for the block, Larson shrugged it off replying "Tony being Tony I guess. I was pretty tight on whoever was inside of me on the restart, and I was looking in my mirror and saw him juke to the right so I juked to the right and he hit me, and I don't know, he was just trying to teach me a lesson I'm guessing." Before the Sonoma race Stewart warned Larson, angrily saying "He'll learn not to block me anytime soon." Larson crashed early in the Coke Zero 400 where he finished 36th. He rebounded the next race at Loudon with a 3rd-place finish. Larson finished 7th in the Brickyard 400. He earned his first Cup Series pole at Pocono Raceway where he set the track record with a lap speed of 183.438 mph (295.215 km/h). Larson missed his chance to make the Chase after poor finishes in the final two regular season races. At Chicagoland, Larson came close to pulling off his first Cup Series victory. After leading over 30 laps, with 18 laps to go he engaged in a battle with Kevin Harvick, allowing Brad Keselowski to catch up and pass Larson for the lead and ultimately the win. After two more cautions, Larson finished 3rd after battling Jeff Gordon who admitted himself as a Larson fan. Larson and Gordon exchanged hugs on pit road over their race and Gordon whispered some advice in Larson's ear over restarts. In a post-race media conference Gordon called Larson "The real deal." At New Hampshire, Larson finished second to Joey Logano. At Kansas, he finished second again to Logano and his 3rd runner up finish. At the season finale at Homestead, Larson finished 13th and won the 2014 Sprint Cup Series Rookie of the year over Austin Dillon with his statistics being higher than other rookie seasons in history, such as those of Richard Petty and Jeff Gordon. Larson pulls a burnout following his first career Cup win at the 2016 Pure Michigan 400. Larson started out the 2016 season with a 7th place outing at Daytona, marking his first top 10 and first non-DNF. Larson ran very well at Martinsville and finished 3rd. He also had a top 5 car at Kansas before being caught up in a crash with Denny Hamlin, Joey Logano and Brad Keselowski and finished 35th. At Dover, Larson led the race with less than 50 laps to go and recovered from being one lap down and running down the leader Matt Kenseth. Larson had the fastest car during the final laps, but couldn't take the advantage of Kenseth's mistakes and finished 2nd. Afterward, Larson stated, "Matt Kenseth, in my eyes is the cleanest racer out there. I didn't want to drive him dirty because he always races me clean. Looking back, I'd do stuff different but my time is coming." At the Sprint Showdown, Larson battled with Chase Elliott for the win in the final segment. The two made contact as they approached the start/finish line, Larson beat Elliott to the line to lock himself into the All-Star Race. 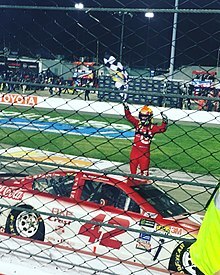 In the All-Star Race, Larson took the lead on the final restart, but was caught by Joey Logano and hit the wall with two laps to go and finished 16th.At the 2016 Pure Michigan 400, Larson won his first ever Sprint Cup Series win, holding off Chase Elliott. The win also qualified him into the Chase for the first time. In his first Chase appearance, Larson finished 18th at Chicagoland and finished 10th at New Hampshire. He was eliminated after Round of 16 after a 25th place finish at Dover. During the season finale at Homestead-Miami Speedway, Larson led 132 laps and finished 2nd. Larson's 2017 NASCAR Monster Energy Cup Series car. Larson and Chase Elliott battle for the lead in the later stages of the 2017 FireKeepers Casino 400, his third career victory. Larson raises the checkered flag in the air after winning the 2017 Federated Auto Parts 400 for his fourth win of 2017, and fifth win of his career. In 2017, Larson took the lead late in the Daytona 500 only to run out of gas on the final lap and finished 12th. At Atlanta, Larson finished 2nd to Brad Keselowski. He would go on to finish second in the next two races at Las Vegas and Phoenix, which allowed him to take the points lead for the first time in his career. Larson earned his second career Cup Series win at the Auto Club 400 after starting from the pole, furthering his points lead. A 17th-place finish at Martinsville Speedway hurt him, but he still maintained a four-point lead over Chase Elliott. In the 2017 O'Reilly Auto Parts 500, Larson rebounded from struggles early to finish 2nd. At Michigan International Speedway, Larson picked up his third career pole and then he led 96 laps to get his third career win, holding off Chase Elliott, just like in August of 2016. At the Kentucky race, Larson started at the rear of the field after he was unable to set a qualifying time as he was stuck in an inspection. He finished 2nd to Martin Truex Jr, but lost his points lead when he was penalized 35 points for an improper rear brake cooling assembly; crew chief Chad Johnston was suspended for three races and Tony Lunders took his place. A week later, Larson won the pole at Loudon's Overton's 301, but was forced to surrender it to Truex after failing post-qualifying inspection for an unapproved rear deck fin lid. He finished 2nd in the event. At the Pure Michigan 400, Larson earned his 4th career win after he made a four-wide pass on Truex, Erik Jones and Matt Kenseth with 2 laps to go . Larson earned his 5th career win at Richmond (and his first win that is not a 2-mile track) in the final race of the regular season. Larson would enter the Playoffs as the 2nd seed tied for the most wins in the regular season with 4. During the Playoffs, Larson was able to easily get to the round of 12 after scoring top 5 finishes at Chicagoland, New Hampshire and Dover. Unfortunately, Larson would end up being eliminated after the Round of 12 after blowing an engine at Kansas, resulting in a dismal 39th-place finish. He would struggle after being eliminated, finishing 37th at Martinsville and Texas, both due to crashes, and a last place finish at Phoenix from an expired engine. Larson finshed 3rd at Homestead and would finish 8th in the standings. Despite not winning a race throughout the 2018 season, Larson made it to the Playoffs by staying consistent with five second-place finishes, eight top-fives, and 13 top-tens. Larson started the Playoffs with his sixth runner-up finish of the season to Brad Keselowski at Las Vegas. At the Charlotte Roval race, Larson was involved in a multi-car wreck on a late restart that also included playoff contenders Brad Keselowski and Kyle Busch. Larson's heavily damaged No. 42 car took advantage of Jeffrey Earnhardt being spun out by Daniel Hemric on the final lap and limped across the finish line in 25th place, securing him in the top 12. He experienced further bad luck at the Talladega fall race when he blew a right front tire and spun out on lap 105. He finished 11th in the race but was docked 10 driver and 10 owner points after the team violated the damaged vehicle policy by using metal tabs instead of fasteners and/or tape to repair the torn right front fender. Larson was eliminated from the Round of 12 after the fall Kansas race despite finishing 3rd. He finished 13th at Homestead and finished 9th in the point standings, the highest of the winless drivers in 2018 along with a third consecutive top-ten points finish. Before the start of the 2019 season, Larson lost his primary sponsor DC Solar, whose headquarters had been raided by the FBI. McDonald's will be the primary sponsor for Kyle Larson throughout the 2019 season. At Atlanta, Larson led over 100 laps before being tagged for speeding on pit road; sending him to the back of the field and finished 12th. On February 26, 2019, Larson sparked controversy on the NBC Sports segment Splash & Go! with host Rick Allen when he jokingly implied that Hendrick Motorsports starts "cheating and finding some speed" a couple of months into the start of a season. He later apologized to Rick Hendrick for his comments. On January 4, 2014, Chip Ganassi Racing announced that Larson would enter the 24 Hours of Daytona, driving the No. 02 car alongside with Scott Dixon, Tony Kanaan and Marino Franchitti. During the press conference, Larson stated, "You grow up watching the NASCAR guys then you're like, ‘wow’ when you meet them. And then watching the guys in different series there's a 'wow' factor to meeting them and working with them." In his Rolex 24 debut, Larson's car stalled, and received a speeding penalty, but finished his stint with a fifth-place finish. Larson returned to the No. 02 Ford Daytona Prototype for the 2015 event, along with Chip Ganassi Racing teammates from IndyCar Scott Dixon and Tony Kanaan and NASCAR Jamie McMurray. The team ultimately won the race. In 2016, Larson once again returned for the 24 Hours of Daytona in a Ford EcoBoost Daytona Prototype, only set to run for one race in the WeatherTech SportsCar Championship for Chip Ganassi Racing. The team consisted of the same drivers from the 2015 winning car, but ran into issues with brake failures plaguing the team throughout the race. Larson made a cameo appearance as a limo driver in the 2017 film Logan Lucky. Larson's mother is Japanese-American and her parents had spent time in a Japanese internment camp. Larson was born the youngest of three children. Larson's partner is Katelyn Sweet, the sister of World Of Outlaw sprint driver and NASCAR driver Brad Sweet. Larson announced on June 13 that he and his girlfriend were expecting a child. On July 16, 2014, Larson announced that the baby is a boy. On December 22, 2014, Larson's son, Owen Miyata Larson, was born. On November 8, 2017, Larson announced on social media that he and Sweet are expecting a second child, due in May 2018. Audrey Layne Larson was born on May 7, 2018. On December 22, 2017, Larson and Sweet became engaged and they later married on September 26, 2018. Larson owns a World of Outlaws Sprint Car team that fields cars for himself, Shane Stewart and Carson Macedo. ^ "Kyle Larson earns Mobil 1 Driver of the Year honors". NASCAR. November 29, 2017. Retrieved December 1, 2017. ^ "Biography". Kyle Larson official website. Archived from the original on 2012-08-26. Retrieved 2012-06-16. ^ a b c d "Ganassi team signs open wheel standout Larson". Fox Sports. February 18, 2012. Retrieved 2012-06-16. ^ a b James, Brant (October 6, 2011). "Phenom Kyle Larson could benefit from a delayed rise to stardom". Sports Illustrated. Retrieved 2012-06-16. ^ Kerchner, Mike (September 25, 2011). "Short-Track Roundup: Kyle Larson completes USAC sweep". Autoweek. Retrieved 2012-06-16. ^ Karis, Tony (July 18, 2010). "Ocean Speedway: Kyle Larson dominates Taco Bravo series, sets track record". Santa Cruz Sentinel. Santa Cruz, CA. Retrieved 2012-06-16. ^ "Larson Adds Another Feather To His Cap". National Speed Sport News. November 23, 2012. Retrieved November 25, 2012. ^ "NASCAR Notebook". Fox Sports. February 13, 2012. Retrieved 2012-06-16. ^ "Larson Wins Again At New Smyrna In World Series Action". Raceweek Illustrated. February 19, 2012. Retrieved 2012-06-16. ^ Bowman, Tommy (June 3, 2012). "LaJoie wins first K&N Series race". Winston-Salem Journal. Winston-Salem, NC. Archived from the original on September 4, 2012. Retrieved 2012-06-16. ^ Miller, Terry A. (June 11, 2012). "Rookie Makes Late-Race Pass For Win In NASCAR K&N Pro Series East Race At Gresham". WMGT TV. Macon, GA. Archived from the original on January 16, 2013. Retrieved 2012-06-16. ^ Wackerlin, Jeff (June 12, 2012). "Larson Takes Winning Ways to Michigan". Motor Racing Network. Archived from the original on 2012-06-13. Retrieved 2012-06-16. ^ "Larson takes checkered flag at Pocono Raceway". ARCA Racing Series. June 7, 2014. Retrieved 2014-06-07. ^ "Field chasing NASCAR's Larson in Saturday's Pocono ARCA 200". ARCA Racing Series. June 6, 2014. Retrieved 2014-06-07. ^ Utter, Jim (November 3, 2012). "Reddick gets win, Larson takes K&N title at The Rock". The News & Observer. Raleigh, NC. Archived from the original on April 11, 2013. Retrieved 2013-03-16. ^ Stiles, R. Mark (June 26, 2012). "Jamie McMurray, Juan Pablo Montoya 2012 NSCS Quaker State 400 Race Previews". Catchfence.com. Retrieved 2012-06-27. ^ Buchanan, Mary Jo (July 2, 2012). "Kyle Larson 'Felt Like a Super Star' With Top Ten Truck Finish". Speedway Media. Fox Sports. Archived from the original on February 2, 2013. Retrieved 2012-08-02. ^ "Kyle Larson holds off Joey Logano". ESPN. April 14, 2013. Retrieved 2013-04-15. ^ Bezjak, Lou (April 6, 2014). "SOUTHERN 500: Larson's performance backs up decision to get into Cup car". The Morning News. Retrieved 2014-04-07. ^ Gluck, Jeff (March 22, 2014). "The story behind Kyle Larson's wild no-wheel victory celebrations". USA Today. Retrieved 2014-03-23. ^ Bruce, Kenny (July 25, 2013). "Miscue forces Larson to settle for second". NASCAR.com. Retrieved 2013-08-18. ^ Pearce, Al (February 6, 2013). "Tony Stewart raves about Kyle Larson, rising star to run full Nationwide schedule". Autoweek. Detroit, MI: Crain Communications. Retrieved 2013-02-06. ^ Blount, Terry (February 24, 2013). "Fans injured during scary wreck". ESPN. Retrieved 2013-03-01. ^ Associated Press (March 22, 2014). "Kyle Larson makes history, wins Nationwide race at Fontana". Sporting News. Archived from the original on March 24, 2014. Retrieved 2014-03-23. ^ Associated Press (November 21, 2015). "Kyle Larson outduels Austin Dillon for XFINITY win at HMS". Foxsports.com. Retrieved February 26, 2016. ^ Spencer, Lee (August 27, 2013). "Report: Earnhardt Ganassi taps Larson". Fox Sports. Retrieved 2013-08-27. ^ Ryan, Nate (August 30, 2013). "Chip Ganassi on Kyle Larson: 'The kid's ready'". USA Today. Gannett Company. Retrieved August 30, 2013. ^ Spencer, Lee (October 1, 2013). "Larson to make Cup debut at CMS". Fox Sports. Retrieved October 1, 2013. ^ Scott, David (October 13, 2013). "Kyle Larson finishes 37th in Cup debut, but learned plenty". The Charlotte Observer. Archived from the original on October 15, 2013. Retrieved 2013-10-14. ^ Estrada, Chris (October 29, 2013). "Kyle Larson to get another Cup start at Texas". NBC Sports. Retrieved 2013-10-29. ^ Bob Pockrass (August 30, 2013). "Chip Ganassi says new driver Kyle Larson ready for Sprint Cup - NASCAR". Sporting News. Retrieved 2014-01-22. ^ Bonkowski, Jerry (February 23, 2014). "Rookie Kyle Larson struggles early in Daytona 500". NBC Sports. Retrieved 2014-03-09. ^ Fryer, Jenna (March 25, 2014). "Kyle Larson's strong showing at Fontana proves he belongs at Sprint Cup level". Star Tribune. Archived from the original on March 28, 2014. Retrieved 2014-03-26. ^ Gluck, Jeff (April 25, 2014). "Kyle Larson wins pole for Richmond race; qualifying rained out". USA Today. Retrieved 2014-04-26. ^ Albert, Zack (April 26, 2014). "LARSON SPINS ON OPENING LAP; BOWYER BURNS OUT". NASCAR. Retrieved 2014-04-26. ^ Pockrass, Bob (June 16, 2014). "Kyle Larson not worried about Tony Stewart reaction". Sporting News. Retrieved 2014-06-23. ^ Bianchi, Jordan (June 20, 2014). "NASCAR Sonoma 2014: Tony Stewart warns Kyle Larson about blocking". SB Nation. Retrieved 2014-06-23. ^ Livingstone, Seth (August 1, 2014). "LARSON LAUNCHES TO COORS LIGHT POLE AWARD". NASCAR. Retrieved 2014-08-01. ^ Pennell, Jay (March 29, 2015). "Regan Smith to drive for Larson, who fainted Saturday, at Martinsville". Foxsports.com. Retrieved March 29, 2015. ^ "LARSON, KYLE BUSCH COLLIDE AS PIT ROAD OPENS". NASCAR. October 11, 2016. Retrieved 2016-03-25. ^ Pockrass, Bob (May 16, 2016). "Matt Kenseth finally gets rewarded with win after string of bad luck". ESPN. Retrieved May 16, 2016. ^ Associated Press (May 21, 2016). "Kyle Larson edges Chase Elliott to earn spot in All-Star race". ESPN. Retrieved May 23, 2016. ^ Bruce, Kenny (May 22, 2016). "HARD LUCK, NEAR-WIN HEARTBREAK FOR KYLE LARSON". NASCAR. Retrieved May 23, 2016. ^ "KYLE LARSON'S VICTORY BURNOUTS". NBC Sports. Retrieved March 26, 2017. ^ Scott, David (February 26, 2017). "Kurt Busch wins wreck-marred Daytona 500". The Charlotte Observer. Daytona Beach, Florida: The McClatchy Company. Retrieved October 18, 2017. ^ James, Brant (March 26, 2017). "Kyle Larson breaks through, wins Auto Club 400 in Fontana". USA Today. Retrieved March 27, 2017. ^ "Kyle Larson finishes 2nd at Texas - Rotoworld.com". Retrieved 2017-04-10. ^ Bromberg, Nick (July 12, 2017). "Kyle Larson loses points lead after 35-point penalty from Kentucky race". Yahoo! Sports. Retrieved July 14, 2017. ^ Associated Press (July 14, 2017). "Kyle Larson's pole tossed after another inspection failure". ESPN. Retrieved July 14, 2017. ^ DesOrmeau, Taylor (August 13, 2017). "Dicey four-wide pass helps Kyle Larson 'steal' third straight win at MIS". MLive.com. Retrieved August 15, 2017. ^ Spencer, Reid (September 9, 2017). "Kyle Larson foils Truex, snags Richmond win in regular-season finale". Nascar. Retrieved September 10, 2017. ^ "Kyle Larson: Top Chevy team depends on who's 'cheating'". NBC Sports. Retrieved February 28, 2019. ^ DeGroot, Nick (February 27, 2019). "Kyle Larson issues public apology to Rick Hendrick for comments". Motorsport Network. Retrieved February 28, 2019. ^ Kelly, Goodwin (January 4, 2014). "Ganassi announces powerhouse Rolex 24 At Daytona driver lineup". The Daytona Beach News-Journal. Retrieved 2014-01-04. ^ Cain, Holly (January 3, 2014). "Larson ready to win a watch at Rolex 24 at Daytona". NASCAR.com. Retrieved 2014-01-04. ^ Cain, Holly (January 25, 2014). "Kyle Larson stays even in Rolex 24 debut". NASCAR.com. Retrieved 2014-03-09. ^ Smith, Steven. "Larson, McMurray win Rolex 24 at Daytona". NASCAR.com. NASCAR. Retrieved 29 August 2016. ^ Spencer, Reid. "Brake failure, Kyle Larson crash take out defending Rolex 24 at Daytona champions". Autoweek. Crain Communications, Inc. Retrieved 29 August 2016. ^ "NASCAR serves as vehicle for heist film 'Logan Lucky' starring Channing Tatum". USA Today. 9 October 2016. Retrieved 24 July 2017. ^ Peltz, Jim (March 22, 2014). "Kyle Larson gets first Nationwide Series win at Fontana". Los Angeles Times. Retrieved 2014-03-26. ^ Lerner, Preston (September 12, 2013). "The Kid: Kyle Larson". Automobile. Retrieved 2014-03-26. ^ Wackerlin, Jeff (June 13, 2014). "Larson to Become a Father". MRN.com. Motor Racing Network. Retrieved June 13, 2014. ^ Richter, Josh (July 16, 2014). "Tutu or tie? Kyle Larson and his fiancé are having a ..." Foxsports.com. Archived from the original on 2014-07-17. Retrieved July 16, 2014. ^ Cain, Holly. "Kyle Larson, girlfriend welcome baby boy". NASCAR.com. NASCAR Media Group, LLC. Retrieved 24 December 2014. ^ Long, Dustin (November 8, 2017). "Kyle Larson's son Owen to be a big brother in 2018". NBC Sports. Retrieved November 9, 2017. ^ Martinelli, Michelle R. (December 22, 2017). "NASCAR's Kyle Larson, longtime girlfriend engaged". USA Today. Gannett Company. Retrieved February 18, 2018. ^ "Kyle Larson – 2013 NASCAR Sprint Cup Series Results". Racing-Reference. Retrieved February 13, 2019. ^ "Kyle Larson – 2014 NASCAR Sprint Cup Series Results". Racing-Reference. Retrieved February 13, 2019. ^ "Kyle Larson – 2015 NASCAR Sprint Cup Series Results". Racing-Reference. Retrieved February 13, 2019. ^ "Kyle Larson – 2016 NASCAR Sprint Cup Series Results". Racing-Reference. Retrieved February 13, 2019. ^ "Kyle Larson – 2017 Monster Energy NASCAR Cup Series Results". Racing-Reference. Retrieved February 13, 2019. ^ "Kyle Larson – 2018 Monster Energy NASCAR Cup Series Results". Racing-Reference. Retrieved February 13, 2019. ^ "Kyle Larson – 2019 Monster Energy NASCAR Cup Series Results". Racing-Reference. Retrieved February 24, 2019. ^ "Kyle Larson – 2013 NASCAR Nationwide Series Results". Racing-Reference. Retrieved February 13, 2019. ^ "Kyle Larson – 2014 NASCAR Nationwide Series Results". Racing-Reference. Retrieved February 13, 2019. ^ "Kyle Larson – 2015 NASCAR Xfinity Series Results". Racing-Reference. Retrieved February 13, 2019. ^ "Kyle Larson – 2016 NASCAR Xfinity Series Results". Racing-Reference. Retrieved February 13, 2019. ^ "Kyle Larson – 2017 NASCAR Xfinity Series Results". Racing-Reference. Retrieved February 13, 2019. ^ "Kyle Larson – 2018 NASCAR Xfinity Series Results". Racing-Reference. Retrieved February 13, 2019. ^ "Kyle Larson – 2012 NASCAR Camping World Truck Series Results". Racing-Reference. Retrieved February 13, 2019. ^ "Kyle Larson – 2013 NASCAR Camping World Truck Series Results". Racing-Reference. Retrieved February 13, 2019. ^ "Kyle Larson – 2014 NASCAR Camping World Truck Series Results". Racing-Reference. Retrieved February 13, 2019. ^ "Kyle Larson – 2015 NASCAR Camping World Truck Series Results". Racing-Reference. Retrieved February 13, 2019. ^ "Kyle Larson – 2016 NASCAR Camping World Truck Series Results". Racing-Reference. Retrieved February 13, 2019. ^ "Kyle Larson – 2012 NASCAR K&N Pro Series East Results". Racing-Reference. Retrieved October 18, 2017. ^ "Kyle Larson – 2014 NASCAR K&N Pro Series West Results". Racing-Reference. Retrieved June 28, 2017. ^ "Kyle Larson – 2012 ARCA Racing Series Results". Racing-Reference. Retrieved February 13, 2019. ^ "Kyle Larson – 2013 ARCA Racing Series Results". Racing-Reference. Retrieved February 13, 2019. ^ "Kyle Larson – 2014 ARCA Racing Series Results". Racing-Reference. Retrieved February 13, 2019. ^ "Kyle Larson – 2014 United SportsCar Championship Results". Racing-Reference. Retrieved February 13, 2019. ^ "Kyle Larson – 2015 United SportsCar Championship Results". Racing-Reference. Retrieved February 13, 2019. ^ "Kyle Larson – 2016 WeatherTech SportsCar Championship Results". Racing-Reference. Retrieved February 13, 2019. Wikimedia Commons has media related to Kyle Larson.